This book provides evidence which makes it clear that most religious history is not what we think it is. It lets you see the true heritage that has been suppressed for centuries. It shows that there was once a greatly advanced and ancient culture that was a global society. This was the Vedic civilization. Even today we can see its influence in any part of the world, which makes it obvious that before the world became full of distinct and separate cultures, religions, and countries, it was once united in a common brotherhood of Vedic culture, with common standards, ideals, language, and representations of God. * How Vedic knowledge was given to humanity by the Supreme. * The history and traditional source of the Vedas and Vedic Aryan society. * Who were the original Vedic Aryans. How Vedic society was a global influence and what shattered this once world-wide society. * Many scientific discoveries over the past several centuries are only rediscoveries of what was already known in the Vedic literature. * How the origins of world language and literature are found in India and Sanskrit. How Sanskrit faded from being a global language. * The Vedic influence and proof of its ancient existence found in such countries as Britain, France, Russia, Greece, China, Japan, Egypt, and in areas of Scandinavia, the Middle East, Africa, and the Americas. * The links between the Vedic and other ancient cultures, such as the Sumerians, Persians, Egyptians, Romans, Greeks, etc. * How Judaism, Christianity, Islam, and Buddhism were all influenced by the Vedic tradition and still contain many Vedic elements within them. * How many of the western holy sites, churches, and mosques were once the sites of Vedic holy places and sacred shrines. * Uncovering the truth of India's history: Powerful evidence that shows how many mosques and Muslim buildings were once opulent Vedic temples. * The need to recognize the real history of the world, and to protect what is left of Vedic culture, the roots of humanity. This book is offered as an attempt to allow humanity to see more clearly its universal origins. However, this book provides enough amazing if not startling facts and evidence about the truth of world history and the ancient, global Vedic culture, that it could quite possibly cause a major shift in the way we view religious history and the basis of world traditions. The book is 353 pages, and 6" x 9" trim size, with Glossary, References, and Index. "The missing link in our understanding of civilization is the Vedic Aryan culture which thrived on the Indian subcontinent in antiquity and which influenced subsequent civilizations in Sumeria, China, Egypt and the Middle East, Europe and Britain, Southeast Asia and as far away as the Americas. 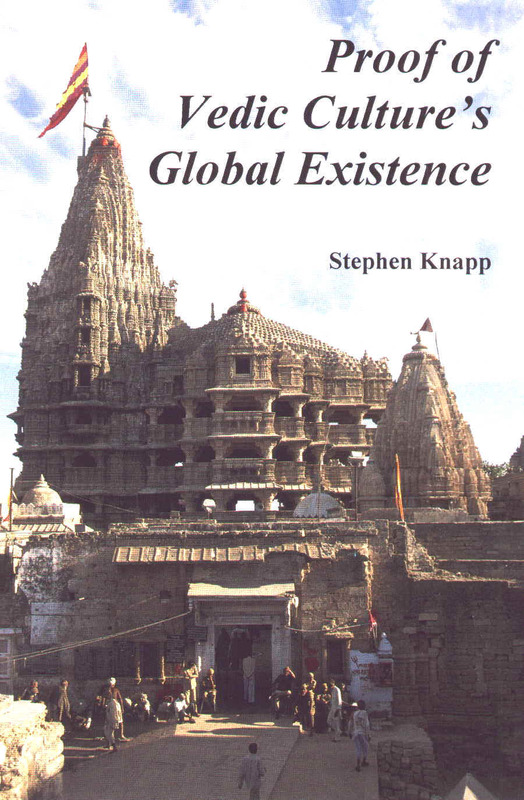 Stephen Knapp, in Proof of Vedic Culture's Global Existence, delves into the history and traditional sources of the Vedas--that ancient body of sacred literature which many regard as the fount of the world's spiritual and cultural heritage." Nexus Magazine, Nov-Dec, 2000. PREFACE * This book is Great Food for thought at the Very Least * About the Name "Hindu." CHAPTER FOUR: THE ORIGINS OF VEDIC SOCIETY: SOURCE OF THE WORLD'S SPIRITUAL HERITAGE * Theories of the Aryan origins * Was there ever an Aryan Invasion? * The Indus Valley Civilization was a part of the advanced Vedic Culture * The Vedic literature supplies no evidence of an Aryan invasion * More evidence for the original home of the Vedic Aryans * The Vedic explanation of the original Aryans and how their influence spread throughout the world * The chronology of events in the spread of Vedic culture * Conclusion. CHAPTER FIVE: THE WHOLE WORLD WAS ONCE IN UNITED IN VEDIC CULTURE * The Vedic tradition is the parent of all humanity * India and Sanskrit: The source of world literature * Worldwide remnants of Sanskrit * How Sanskrit faded from being a global language and what shattered the global Vedic culture * Vedic culture is the original ancestor of all religions. CHAPTER SEVEN: THE VEDIC INFLUENCE FOUND IN THE MIDDLE EAST AND AFRICA * The Hittites * The Mitanni * The Sumerians * Persia * Afghanistan * Iraq and Iran * The Kassites * Israel * Arabia * The Parsis * The Druze * Egypt * Africa. CHAPTER TEN: THE VEDIC INFLUENCE IN EUROPE AND RUSSIA * The Vedic influence in Britain * Stonehenge and the Druids * Ireland * France * Scandinavia * Lithuania * Germany * Central Europe * Spain * Italy * The Pope and the Vatican * Greece * Russia. CHAPTER ELEVEN: CHRISTIANITY AND THE VEDIC TEACHINGS WITHIN IT * A brief look at Christianity's beginnings * Paganism in Christianity * The sectarian development of the Christian Scriptures * The Vedic influence on Christianity * The dark side of Christianity * The prison of religion * Jesus Taught Bhakti-yoga * Do all Christians go to heaven? * The Bible teaches the chanting of God's names * The names of God. CHAPTER TWELVE: THE VEDIC INFLUENCE IN THE ORIENT * Java * Indonesia * Borneo * Malaysia and Singapore * Thailand * North and South Vietnam, Cambodia and Laos * Korea * Myanmar (Burma) * China * Buddhism * Japan * Reiki. CHAPTER THIRTEEN: THE VEDIC INFLUENCE IN THE ANCIENT AMERICAS * More Vedic links in the Inca language * Other cultures that came to America. CHAPTER FOURTEEN: UNCOVERING THE TRUTH ABOUT INDIA'S HISTORY * The plot to cover Vedic archeology in India * The Taj Mahal was a Hindu temple * The misidentified so-called Muslim buildings in Delhi * The Kutab Minar * Other buildings around Delhi * Ahmedabad * Bijapur * Misidentified Hindu buildings in other areas * Hindus constructed, Muslims destroyed * Time to plan the survival of Vedic culture * An action plan for the survival of Vedic Culture in India and elsewhere. This book is 430 pages, 6"x9" trim size, and $20.99, and is available at your bookstore (ISBN: 1439246483) through special orders. AVAILABLE AT ALL OTHER LOCAL AMAZON OUTLETS IN LOCAL CURRENCIES.